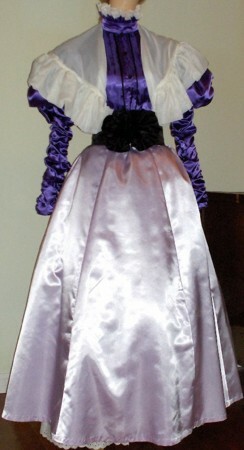 This bustle dress can be worn from 1870s thru the 1880s. Although this dress, is a two piece, it's designed to be worn with the large bustle, or padded bird cage style, which we also make. See bustle or call on this item. 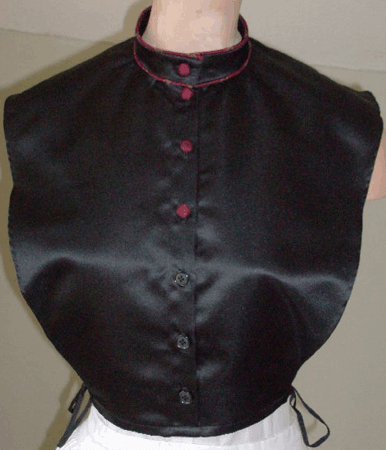 The picture on the left shows it to be a bodice, separate from the skirt. It's pointed in front with a little ruffle look in back. Buttons down front. Long full 3/4 length sleeves that tie above elbow, yet can be made straight and wrist length if you like. There's lace/ ruffle around collar. Bodice has that sort of a jacket look, that they wore then. At waist there's a tie, that goes around and ties in back. 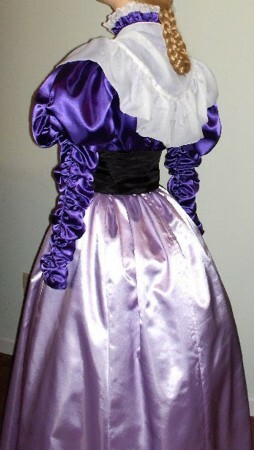 The top shorter skirt will have material or lace ruffle on the end, along with the lower skirt. Suggest walking length. This dress can be made to fit a variety of images, from the everyday woman up through a wealthy upper class woman, depending on material and trim. Prices vary according to the materials chosen and the amount of work that goes into making each dress. Materials: can range from cotton, drapery, and taffeta. See general information above. Call or e-mail Frances to discuss your needs and desires. Trim and Style (Use): The amount of trim varies with the intended use and social status of the owner. It can vary from no trim for a simple work/day dress to very fancy for a fancy tea or evening dress. The shopping cart offers five (6) levels for this dress: Plain Day Dress, Day Dress (simple trim), Day/Tea Dress (moderate trim), Tea Dress (fancy), Evening Dress (fancy or very fancy). We will add more pictures to show samples of the different levels as we can. For other variations or amounts of trim, please call or email us and talk about your needs/desires. 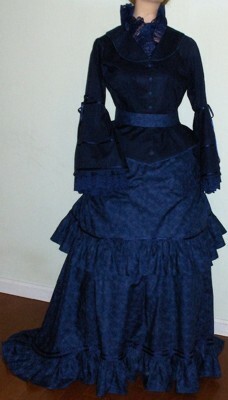 Period: This dress can be made for the 1870s or 1880s period. Train: The train can be made as a Straight (Walking) Train, a Short Train or a Long Train. Height: With shoes you will be using (Item 1 from measurement chart). Bust/Chest: Around the chest (Item 4 from measurement chart). Waist: Around the natural waist (Item 14 from measurement chart). Stop Sign: From center of base of neck to the middle of wrist. With the arm straight out and elbow bent with the forearm vertical, like stopping traffic. (Item 10B from measurement chart). Center Back Length: From base of the neck to the waist. (Item 13B from measurement chart). Waist to Floor: From the spot where your waist band goes, over the hips, then straight down to the floor. (Item 17 from measurement chart). Or even better fill out Measurement Chart. We DO NOT make identical dresses. DO NOT ask for a dress "just like" one that we have already made. Something must be changed: color, trim, fabric design or dress pattern. Also many of the fabrics shown are no longer available. That is why we don't list specific fabric choices. Custom made item, please allow 4 - 8 weeks for delivery. Custom Clothing and Uniforms are not returnable. Starting price is for cotton material and style shown, other materials, modifications, additional trim or other changes will affect the price. Rush orders MAY be available for an additional price, call us about this. A rush order reduces the manufacturing time but DOES NOT include faster shipping, for faster shipping use the shipping option on the "View Cart" page. This is a very beautiful dress that can be worn by most. The top is a long bodice as you can tell. It can be lined or unlined depending upon material used. There is a tucked point on each side and a the long hanging section in back gathers due to the tucks on the side. 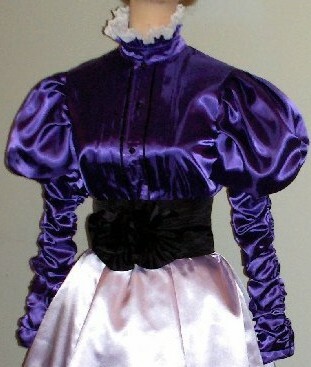 The sleeves are 3/4 long sleeves with ruffles. The bodice / top around the neck can be filled with material for a high neck or cut out for an evening look or a blouse/dickie (under blouse/dickie sold separately) could be used to change it back and forth (open and covered). Buttons up the front. 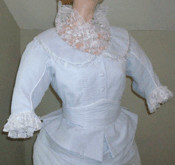 Ruffles, fringe or lace outline the bodice edge. 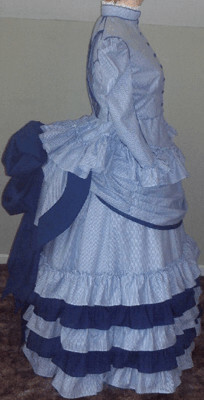 The under skirt is rows (10 to 11) of ruffles, as shown. It is not boned. Suggestions: A quarter moon bustle is normally not required nor suggested. A very stiff slip to make the skirt stand out and/or a 2 bone hoop. Suggest in material, (bodice or skirt) one being print and the other one being solid. Material (cotton: print and solid okay), color, neck cut. The addition for a gathered under slip, or hoop. Price for this dress starts at $459.25 for brocade special occasion or light weight drapery material. It can also be made from silk or other more expensive custom fabrics for addition cost. 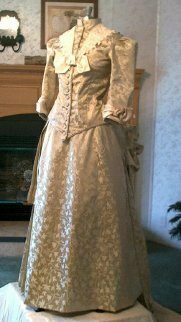 The dress, shown at the above, is the prototype with heavy brocade drapery material, unlined, square neckline bodice (under blouse sold separately), with front button closure. 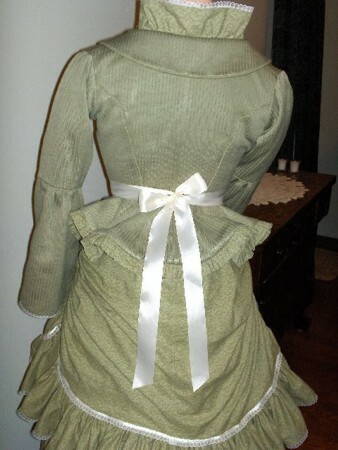 The skirt is of a cotton lining with a woven fabric for the ruffles, hook closure and placket is in center back. Embellishments are of skirt ruffles, black fringe, black buttons, black ribbon bows, and an under-sleeve ruffle made of black lace and fabric. 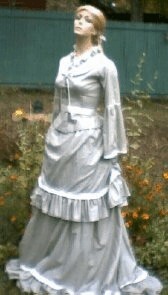 With the heavy drapery it sells for about $940.00 and weighs about 10 pounds. Note: The Polonaise is a coat-like dress, originally worn by Polish women and was extremely popular in the 1770s and 1780s in Western Europe and North America. It consisted of a fitted bodice with a full skirt, draped in front from the waist and caught up on either side at the back, so that it fell in three large loops. This fashion was derived from the Polish Milk-maids, who would tuck their skirts into the waistband or tie up their skirt tails, in order to keep the hems out of the mud and mire. 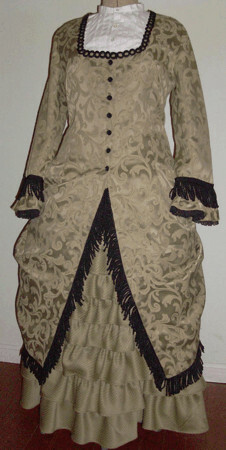 This Polonaise style dress came back in fashion during the Victorian Era, giving it a more formal look, adding embellishments to the tunic bodice and walking skirt. Fabrics used were light weight linen, cottons, muslin, broadcloth or batiste. Want to make your own dress? 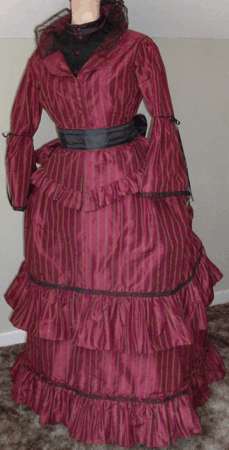 1880s Polonaise and Walking Skirt. 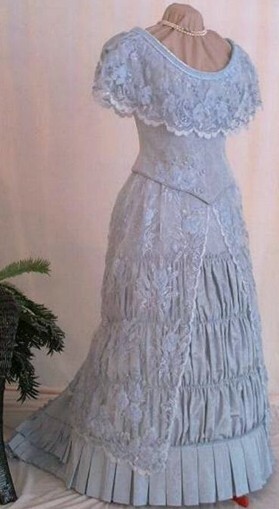 This delicate, doll-like ensemble is made of fine white batiste, Valenciennes lace and silk ribbon. An open square neck is an option worn in the afternoon or evening. 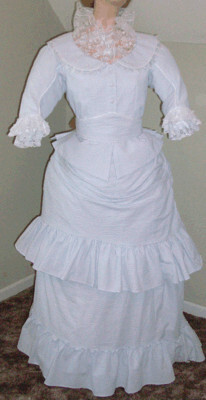 The skirt is a gored underskirt of unbleached muslin with a white batiste ruffle overlay. 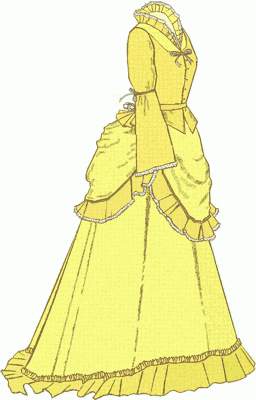 The bustle is created at the hips by the drapery. This pattern is multi-sized 10 through 20. All the sizes are in one package. Look at our National Standard size chart for your size. All sizes require 4 1/4 Yds. of 45 inch wide fabric for the tunic and skirt ruffles. If this dress is made of a printed cotton consider using reproduction calico buttons. Not everything we have available is on our web site. We can make dresses from other patterns and also from photographs. We made this dress for a customer, based on this photograph. More information coming soon. 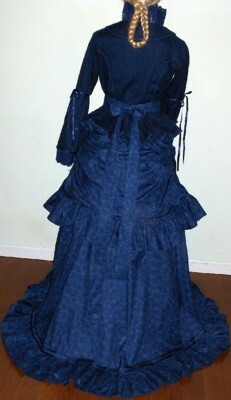 We can make Formal, Wedding, Reception and Ball bustle dresses for the 1870s, 1880s and 1890s periods. Call, Write or E-Mail with your interests and we will try to accommodate your needs. The dress pictured on the left is one that is already made up and ready to ship, it does not count as a "Custom Item". It is a "One of a Kind", as all of our dresses are. Click here for more information on this dress. Please Call, Write or E-Mail with your specifications for having a custom dress made. Prices vary depending upon the amount of work and materials used. We are looking for additional seamstresses to make ladies and childrens clothing items for us as well as additional suppliers of ladies and childrens clothing items.